It's late September, and we thought we'd get an early start on the October newsletter. It's been so busy around here at Braunfels Labs, home of SulfurSoap.com and SAL3.com, that we'd thought we'd start a couple days early. Yes, we truly luv our customers. And the honest and nice feedback we receive from our customers makes us feel so good, and gives us the extra energy to provide that extra level of customer service when the times get rolling, and things so busy, if you know what we mean. You see, it's that special email or phone call letting us know how we helped you that makes our day and our jobs so rewarding. Money helps pay the bills that we all have, but it's the personal warmth and everyday feeling of doing good things for other people that makes our work so rewarding. Loyal customers have been purchasing directly on SulfurSoap.com for years. This year, we began to also offer on the Amazon marketplace. The cost structure is different on Amazon, as like anything in the retail world, whether shopping centers in your neighborhood or places like Amazon, there is a 'rental' cost and overhead cost burden imposed by Amazon. But no worries, we still offer free shipping on SulfurSoap.com and offer very competitive shipping prices on Amazon together with competitive item prices. Most of the items purchased on Amazon ship for only $1, and we just started to offer some products for Amazon Prime customers, for those of you who subscribe to this service. Always free shipping on SulfurSoap.com ! 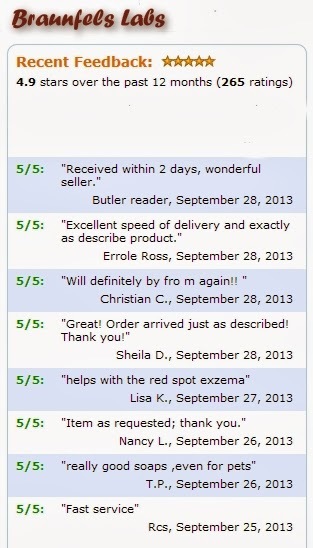 Anyway, thought you'd like to see some of our positive feedback from our wonderful customers purchasing on Amazon. Yes sir-ee, they seem to luv our fast shipping, too! Thank you, everybody. Blessings to you, and if there is anything we can help you with, please let us know.